As I mentioned previously in my IMATS haul post, I purchased two sets of Naked Cosmetics pigments from their booth. They have these pigments on their website for $59.99 a set but the show price was two sets for $50.00 and no taxes so I thought that was a good deal. 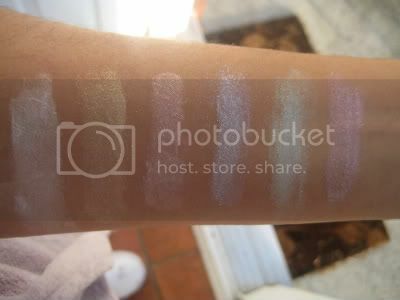 Naked Cosmetics website describes these as: "Naked Cosmetics Mineral Pigments. 100% Oxidized Mica. 6 colors come in a collection. All colors are individually lidded". And these babies are pigmented! You need the smallest amount to get the affect needed. Also, I use pigments a lot on a daily basis so I'm used to bit of fallout with MAC, OCC and NYX pigments but the fallout with Naked pigments was very minimal. The individual pigment jars in each set don't have a name, just a number, so I will review them by just describing the shade. Ebony set is much like the MES in MAC's Style Black as in all the pigments have black undertones and hence are dramatic bold colours. I would say these are superior to the MES as they do not require a black base to reach opacity. I have layered them over Black GPS just so you see that it doesn't really make a difference. These colours are ideal for a night out smokey look and the ladies who love dramatic looks like myself are very much drawn to the black base in these. All colours apply beautifully and effortlessly; I would say only the black had to be layered twice the get the desired affect. The bronze and blue colours have a sheen to them and the rest have small glitter particles but are not as glittery and gritty as the MES. Left to right: dark gold bronze, dark blue, blackened silver, blackened purple, black with silver reflects, blackened forest green. The Ivory set consists of ivory coloured pigments that each reflect a different tone. 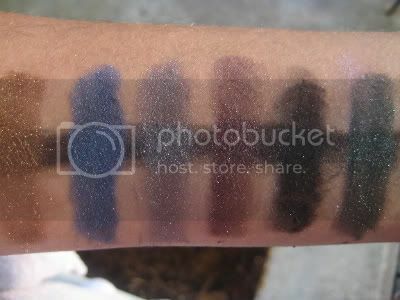 For those ladies who are a fan of MAC's duochrome eyeshadows and pigments, you know exactly why I got this set. I have been using at least one these colours in my look every day as they compliment any look you have in mind. You can also layer this over coloured bases or apply them damp to get the duochrome to show up more; though they are already quite pigmented. These colours are ideal for highlighting the brow bone and tear duct. Most of these are either matte or have a soft sheen. Left to right: ivory, pale yellow, pale peach, icy blue, mint green, pale lilac/pink. Hope you enjoyed this review. If you get a chance at purchasing these pigments, I definitely recommend them. 2 Responses to "Naked Cosmetics Swatches and Review"
Wow, those swatches are beautiful! Thank you for posting them.